John has been interested in the bush and nature since he was a child and has been traveling around Southern Africa with his family in their ongoing pursuit for wildlife since he was a mere eight months old. He has a variety of varying interests, but biodiversity and conservation are where his heart lies, with bats and birds occupying most of his time. John is currently studying toward an LLB degree through the University of South Africa but is also a qualified Nature Guide through the Field Guides Association of South Africa (FGASA), where he holds both Terrestrial Level 1 and National Bird Guide qualifications. John’s infectious passion for the world’s avian gems and their conservation is portrayed in his high energy, enthusiastic approach to life, and, just like in his rugby days, in his willingness to tackle challenges head-on. John works as a tour leader for Birding Ecotours throughout Africa, Asia, the Indian Ocean Islands, and the southern Oceans. 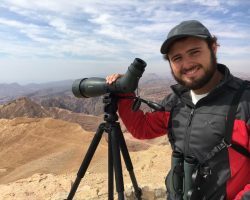 Being one of Southern Africa’s foremost young birders, having observed over 850 species on the subcontinent by the age of 22, his eagerness to see and learn more has seen him travel abroad to many other countries across the globe in his constant avian pursuit. These include the likes of China, Australia, Israel, the southern Oceans, the United States, and the United Kingdom (England and Scotland), and he is also one of only six people to have ever seen over 800 species in the southern African sub-region within the space of a calendar year and set the record for the youngest person to ever do so (19 years old, 2014). John also formed part of the first-ever southern hemisphere youth birding team to participate in the famed Champions of the Flyway bird race in Israel, his team raising in excess of €8 800 for Doğa Derneği (BirdLife Turkey) and in doing so generating huge amounts of awareness around the killing of birds on migration across the Mediterranean. This saw the team win both the ‘Guardians’ and ‘Knights of the Flyway’ titles for 2017; the first-ever team from the southern hemisphere to do so. A complete ‘petrel-head’, John is in love with anything pelagic, and his passion for these hardy ocean-dwelling species has seen him spend many a day out in the southern oceans conducting scientific surveys for the ‘Atlas of Seabirds at Sea’ project, which aims to properly map the distribution of the southern oceans’ sea birds. He also contributes a great deal to other local South African citizen science projects and regularly raises money and awareness for crucial bird conservation initiatives, whether locally or abroad.